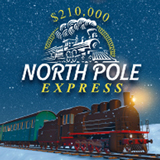 Inspired by the classic Christmas movie, Polar Express, Intertops Casino players are heading to the North Pole over the Christmas holidays in a quest for $210,000 North Pole Express casino bonuses. The giveaways continue into the New Year with 300 frequent players will getting casino bonuses up to $500 each every week. One of those lucky players will also get a $1000 cash prize at the end of the journey. Intertops players earn frequent player points when they play and top point earners win top bonuses – up to $500 every Monday. But you only need to deposit and play as little as $25 between Monday and Wednesday to qualify for additional Thursday bonuses -- up to $150. Frequent players win weekly bonuses up to $500 each. North Pole Express Casino Bonuses continue until January 30, 2017. Contest details and current scoreboard rankings. Intertops Casino has a huge collection of online slots and table games like Blackjack and Roulette, all from Realtime Gaming. Its new mobile casino has games from two major software providers, giving them one of the biggest selections of the best real money mobile casino games as well.